Cooks Get A New 'Recipe View' From Google : The Two-Way Not everyone who uses Google to look up "molten chocolate cake" is looking for an explanation of what the dish is. After all, the name kind of gives it away. The web has become the nation's recipe box — and Google's making it easier to sift through, thanks to its new Recipe View. 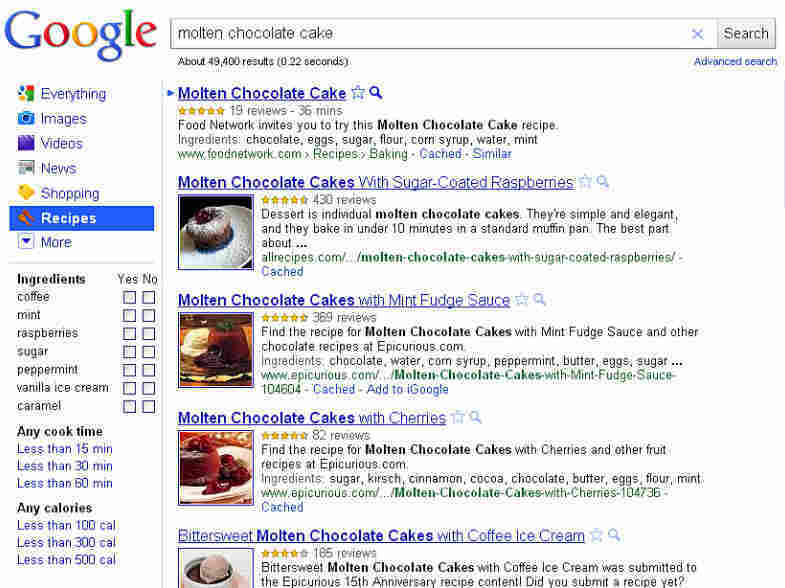 Variations On Chocolate Cake: Google's new Recipe View is designed to help cooks sift through recipes on the web. Here, the results for a search for Molten Chocolate Cake. Not everyone who uses Google to look up "molten chocolate cake" is looking for an explanation of what the dish is. After all, the name kind of gives it away. The web has become the nation's recipe box — and Google's making it easier to sift through, thanks to its new Recipe View. Just as you can refine searches to filter results for images, news, or shopping, Google's Recipe View tells the search engine to return only results that look like recipes. And in a nifty touch, a column of optional ingredients pops up on the left-hand side of the page, so you can even go further in refining your attempts to replicate Aunt Vera's famous she-crab soup. Using the column, you can choose or exclude ingredients, from cream or salt (expected) to mace or sherry (for the cognoscenti). For the lazy or the dieting, there are also checkboxes that let you select various cooking times and calorie counts. Recipe View comes as home cooks are increasingly bringing laptops, iPads and other gadgets into the kitchen, shortening the digital gap from screen to stove — as NPR's Lynn Neary has reported. In related news, a new site called Cookzillas also got some early notice today — using what it calls a "Google Custom Search" to return recipes to cooks who need a hand. Unlike Google's broader Recipe View, Cookzillas culls its results from specific web sites — it lets foodies submit URLs for consideration. So far, the site, which says it's in an early "beta" phase, seems to be leaning rather heavily on foodnetwork.com, bettycrocker.com and food.com. On its site, Cookzilla also provides a list of top recent searches, which is at least interesting to glance at. At the time of this writing, cupcakes topped the list, followed by recipes for chicken breasts, chili, salmon, and pasta. Recipe View and Cookzillas might give new options to folks who can't find exactly what they want on stalwart sites like epicurious or chow.